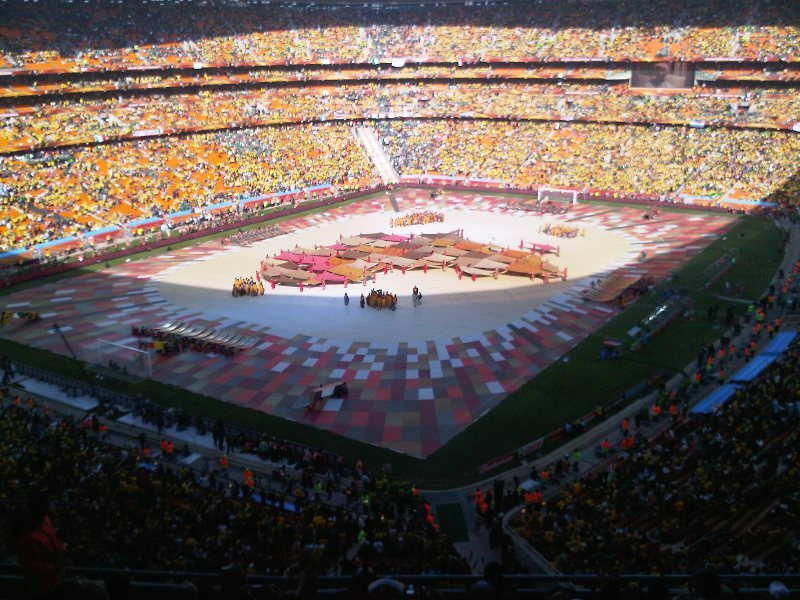 On June 11, 2010 – with the roaring boom of five fighter flyers and the equally thunderous trumpeting of thousands of vuvuzelas – the day Africa and much of the world had been waiting decades for finally kicked off: the opening ceremony and match of Africa's first ever World Cup. 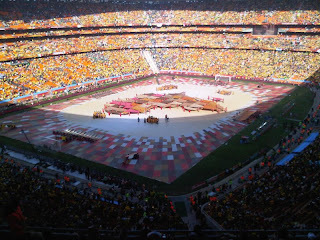 With nearly 1 billion people tuning in throughout the globe and a crowd of nearly 85,000 in the Johannesburg stadium, I felt like Charlie singing I've got a Golden Ticket as our double-decker bus floated merrily towards Soccer City, Africa's version of the Chocolate Factory. 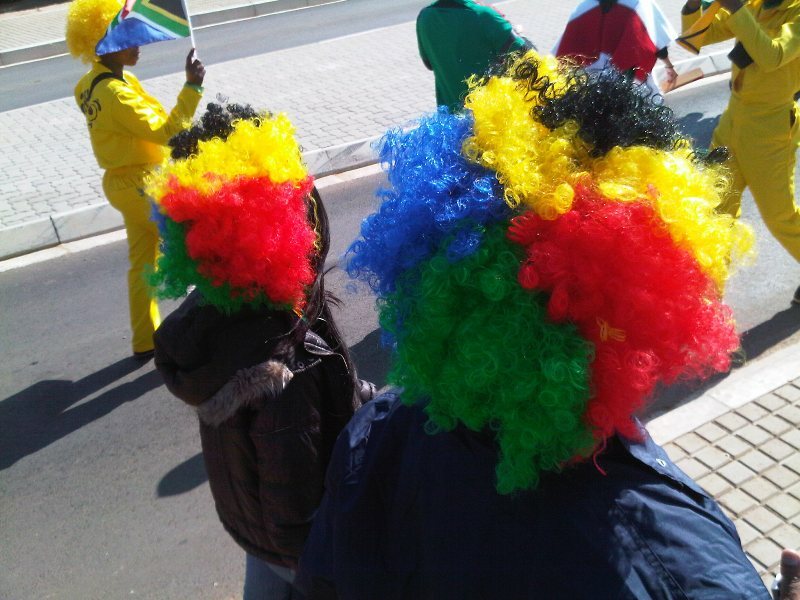 If the vuvuzelas on the bus weren't a loud enough awakening that this wasn't a fantasy world, the bright Ronald McDonald colored wigs and jump suits definitely were. 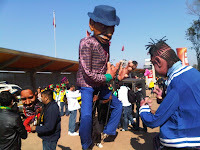 As the masses migrated towards the rainbow colored Soccer City stadium, songs of South African freedom, victory and unity completed the scene by coloring the air with a cloudless, bright blue backdrop. 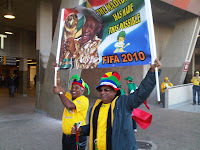 Two fans in particular paid respect to the man who inspired and gave meaning to many of these songs, as they circled the stadium holding a 3x5 banner of Nelson Mandela with the words Madiba has made this possible. 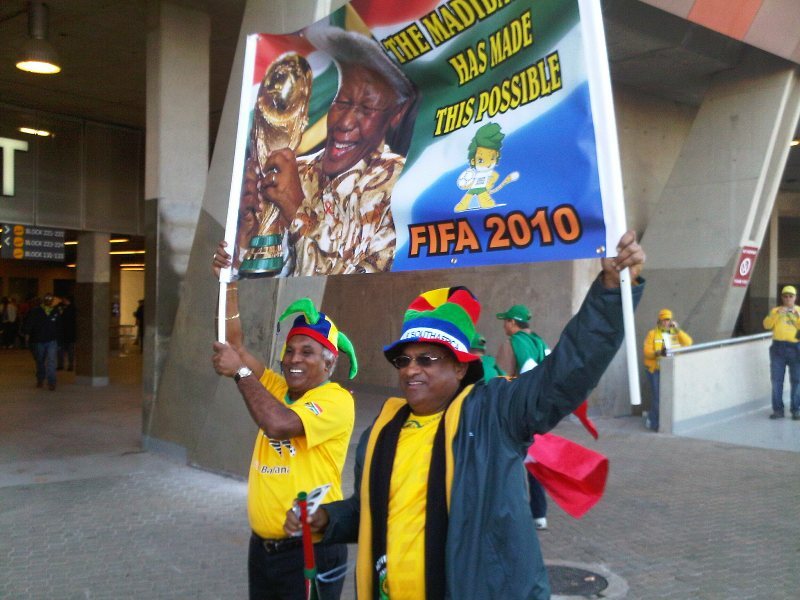 As I thought about Madiba and the impossible dream he had of a unified Rainbow Nation, I was reminded of scenes from the film Invictus, where millions of white South Africans were shocked by the support of black South Africans as the national rugby team surprised the world by winning the Rugby World Cup, a traditionally white sport in SA. 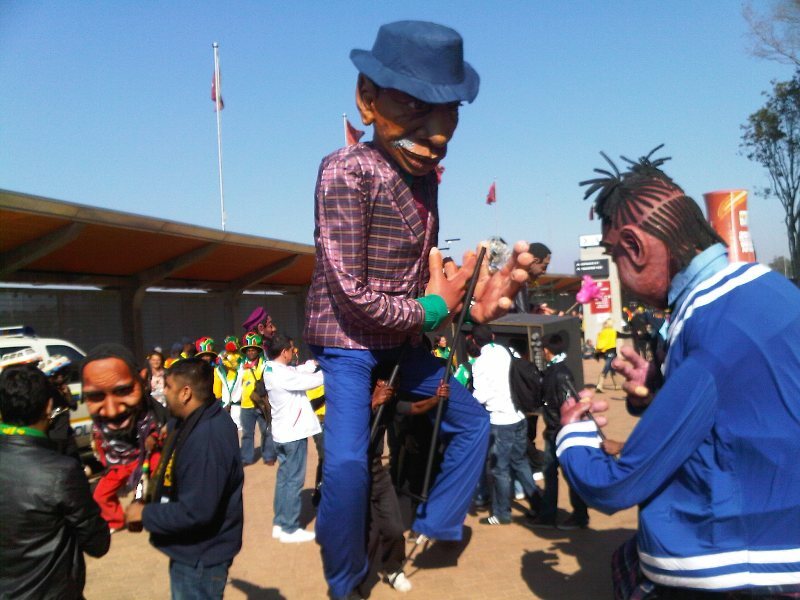 Fifteen years later, I was equally speechless to see the number of Afrikaners supporting a game that's viewed in South Africa as a black sport. 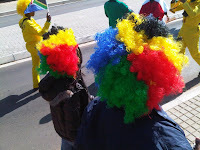 Regardless of color, a white South African at the match told me that Afrikaners had not forgotten the support blacks showed them in 1995. 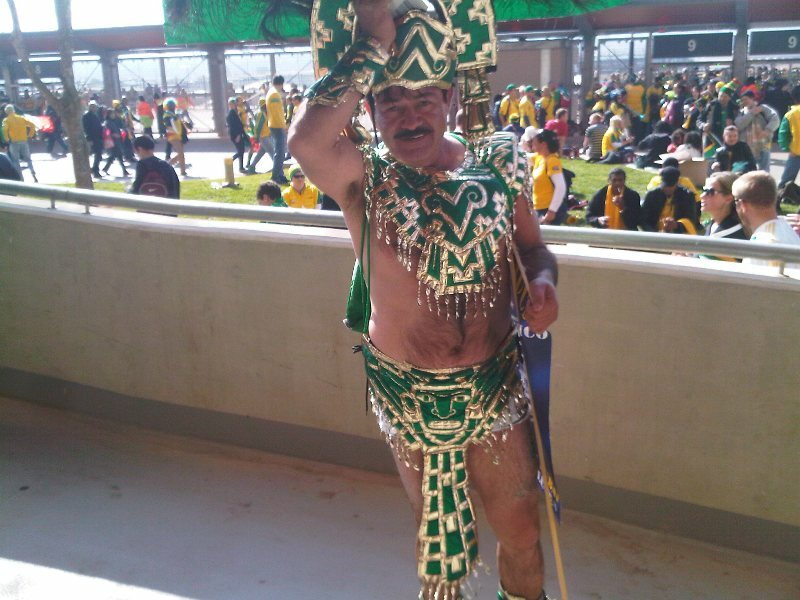 This is South Africa's tournament, he proudly proclaimed. It was a powerful reminder of how insignificant our racial differences can be. At the opening concert, Nobel Peace Prize winner Desmond Tutu solidified this reality when he addressed the crowd in Soweto – the Harlem of South Africa – and the audience across the world: We are all Africans... Thank you for helping this ugly ugly caterpillar become a beautiful beautiful butterfly. And sitting at the match – in between a group of five Afrikaner miners, an English couple, and a Zulu mother and her daughter – this butterfly seemed to reach new heights, as Tshabalaba rocketed a shot into the back of the net for Bafana Bafana and the entire stadium erupted into euphoria. As I was texting about the goal with my family in Kenya, Gchatting with my sister in Costa Rica, BBMing with my friend in India, and emailing the rest of my family/friends back in the States, I was reminded how small and interconnected this world really is. As Desmond Tutu said, Africa is the cradle of humanity. We're all Africans. Although we might be cheering for different teams, chanting in different languages or wearing different colored jerseys, we're all distant relatives and collectively our different colors create a unified rainbow. Now if only we can discover how to ensure that rainbow extends beyond the final match.